In my view, Captain Schettino, dubbed “Captain Coward,” is not getting a fair hearing. It remains unclear exactly whose fault it was that the Costa Concordia struck those rocks. Given the sophisticated technology at their disposal, why did no one on the bridge realize that those rocks were there? Captain Schettino says that it was thanks to his skill and what he did after the impact that the lives of nearly all those onboard were saved. After the Costa Concordia hit those rocks, she remained afloat for around an hour before coming to rest on the seafloor just yards off the coast, less than a mile further on from the rocks she had hit. It was only then, once the ship had beached, that Captain Schettino gave the order to abandon ship. And it was only then that the ship eventually capsized on her port side. Within 40 minutes of beaching however, all but 300 passengers and crew had been safely evacuated. At the time of the disaster, an excellent shipping news Internet site”gcaptain.com“did a simulated reconstruction of what had happened based on the AIS data (Automatic Identification System)”the automatic open-channel tracking system used on ships and by vessel traffic services to identify and locate vessels. According to this reconstruction, eleven minutes after the impact with rocks, the Costa Concordia came to a halt 500 meters off the coast with her bow pointing away from the island. It took her 59 minutes to turn around and head back toward the island. She beached on the seafloor only 50 meters from land. If stationary and without power, how did she manage to turn around and nearly get to shore? On the gcaptain site, the shipping experts said that the only way Captain Schettino could have done such a thing was by using the Costa Concordia‘s three bow thrusters, which do not depend on the main engine room for power. 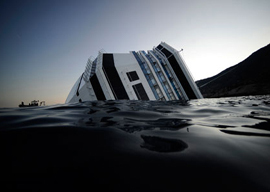 Photographs of the stricken Costa Concordia taken at the time by survivors from the shore clearly show that she capsized only after she had beached, and slowly at that. They show that the ship beached more or less upright and only then began to tilt. They also show that the ship began to tilt only after the lifeboats and life rafts had been launched”not before. And they show these life vessels in the dead-calm sea with people in them. The charge is that Captain Schettino should have given the order to abandon ship far sooner, when the ship was well out to sea. Sure, he could have done that as soon as the ship had come to a halt. But the ship was afloat and not in danger of immediately capsizing. What caused the ship to capsize”but only slowly and after the life vessels had been launched”was the impact when she beached. Captain Schettino abandoned ship before the last passengers had done so. But under international law, a captain does not necessarily have to be the last person to abandon ship. What counts is not where a captain is but what a captain does. If the trial reveals that the will of God caused the Costa Concordia to drift back to shore rather than Captain Schettino’s bow thrusters, I am perfectly willing to eat my hat.